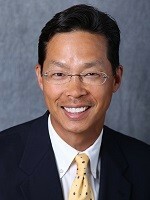 Dr. Ian Lin is an Urbandale native who joined Des Moines Orthopaedic Surgeons (DMOS) in 1997 after completing his education at Grinnell College and the University of Iowa Medical School. While Dr. Lin’s practice encompasses most areas of general orthopaedics, he has special interests in: joint replacement, arthroscopy, sports medicine, trauma care, matrix-induced autologous chondrocyte implantation (MACI), and MAKOplasty® robotic-assisted partial knee replacement. Dr. Lin sees patients with a wide variety of conditions ranging from total joint replacements to simple hand procedures. He has built his extensive practice based out of the DMOS East location and enjoys working with patients of all age groups. Outside of practice, Dr. Lin coaches spring and fall baseball for a local area high school. He also enjoys spending his time in active outdoor pursuits such as kayaking, fishing, golfing, and above all – spending time with his wife and five children. The Arthritis Foundation is honored to recognize Dr. Ian Lin as our medical honoree for this year’s Jingle Bell Run on December 1st at Des Moines Orthopaedic Surgeons Center in West Des Moines, Iowa. Join Dr. Lin in the fight against arthritis, register or donate today! It was 1991, Stacie was just three years old when she suffered a C1-C2 cervical spine subluxation and lost all mobility in her neck (the first two cervical vertebrae allow us to turn our head from side to side). Stacie’s pediatrician recommended that she see a pediatric orthopaedic surgeon in Des Moines. After weeks of inconclusive tests, several MRIs, and multiple braces to stabilize her neck, the surgeons diagnosed Stacie with juvenile rheumatoid arthritis of the cervical spine. 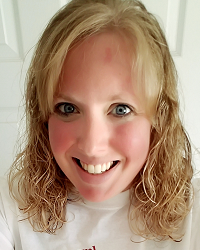 Stacie was referred to a rheumatologist at the University of Michigan Medical School in Ann Arbor, Michigan. After a week-long visit to Michigan, Stacie was admitted to Blank Children’s Hospital, where she spent four weeks in head halter traction. Stacie spent her fourth birthday at Blank Children’s Hospital in head traction and when signs of continued pressure on her spinal cord become more apparent, the surgeons recommended surgical stabilization. The goal of the surgery was to stabilize the C1-C2 vertebrae of Stacie’s cervical spine, to remove pressure from the spinal cord and to relieve the pain caused by the subluxation. The operation was complex and carried significant risks of potential paralysis. In June of 1992, Stacie was transported to the Mayo Clinic in Rochester, MN, where she underwent six hours of surgery to fuse her C1-C2 vertebrae, and then spent the next 16-weeks in skeletal head traction. As Stacie started school, the pain and swelling continued to develop in her wrists, elbows, knees and ankles and she was diagnosed with Juvenile Rheumatoid Arthritis. During a follow-up medical exam, Stacie's pediatrician noticed redness and inflammation in her eyes and recommended that Stacie see a pediatric eye specialist in Des Moines. Stacie has severe uveitis, which has resulted in Glaucoma and Cataracts. To learn more about Stacie's journey or to donate in her honor please visit her fundraising page. 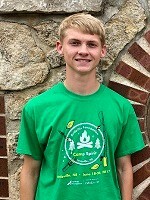 Kyle Elmore is a talented tennis player; and you would never know by watching his backhand shot that this 16-year-old athlete from Clive, Iowa has polyarticular juvenile idiopathic arthritis (JIA). Kyle was diagnosed with JIA at age 12, but he decided that he was not going to let that stop him from doing the things he loved. Kyle’s initial journey with arthritis was a long and frustrating one, which included several doctor visits with a variety of specialists, and no answers in sight. “I remember experiencing a lot of pain in my knees and ankles, especially in the morning” stated Kyle. “My knees were so swollen that you couldn’t see my knee caps!” Kyle also noticed difficulty running during baseball and tennis practice and had swelling in his hands. After 6 months of inconclusive lab tests and endless referrals, Kyle and his family went to see a pediatric rheumatologist at the University of Iowa Children’s Hospital in Iowa City, a two hour drive from their home in Clive. Kyle was immediately diagnosed with JIA and soon after started a treatment plan to prevent permanent damage to his joints and help manage his pain. “The news was really hard to hear,” recalls Kyle. His family finally had answers, but they also had a lot of questions. There was no family history of arthritis, and they were uncertain if Kyle would be able to play sports again. Kyle had to put baseball and tennis on hold in order to get his arthritis under control. To learn more about Kyle's journey please visit his team page, Kyle's Crusaders. To donate in support of Kyle, please visit his fundarising page.